Good morning to all the dear blog followers and readers!! 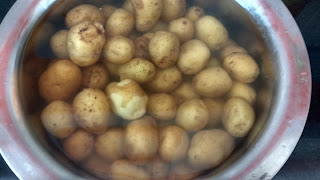 Today I am going to share the recipe for "Masala Baby Potatoes". 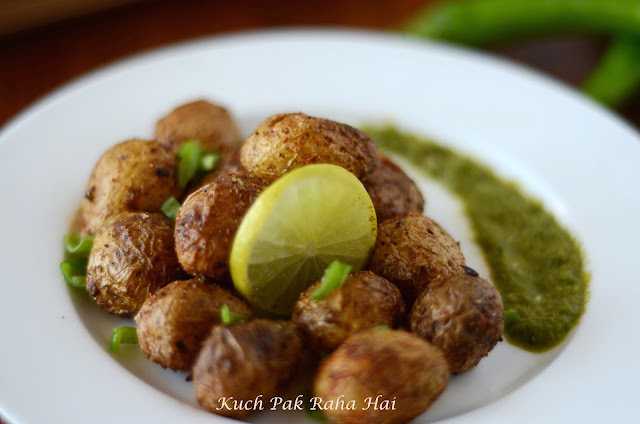 It is a spicy-tangy combination of baby potatoes and various other Indian spices topped up with freshly squeezed lemon juice. 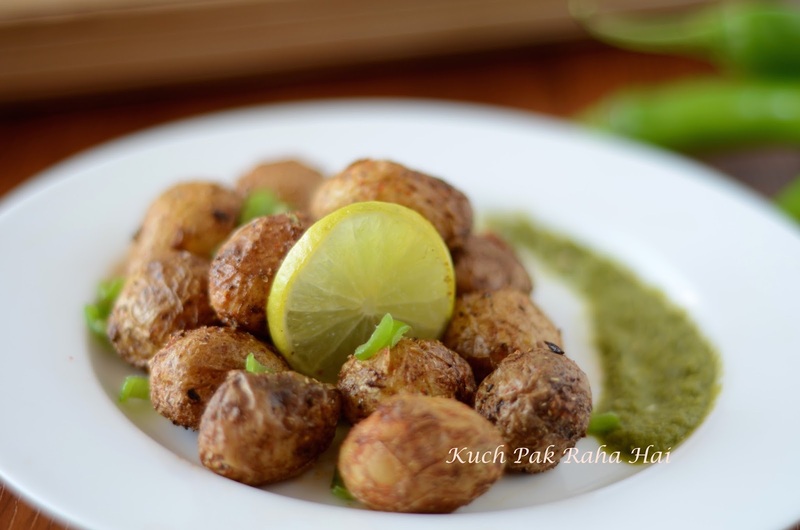 It is an all rounder dish as you can serve them as a starter, or an evening snack or even as a side dish. 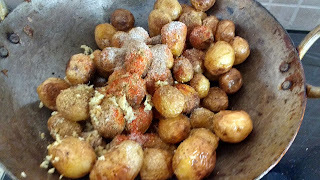 I made it yesterday evening during my tea time and ended up having so many that I had to eventually sacrifice my dinner :D.
This recipe is quite a simple one. 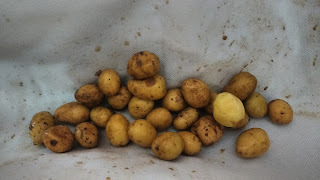 The only effort goes in washing up and cleaning these small miniature potatoes. 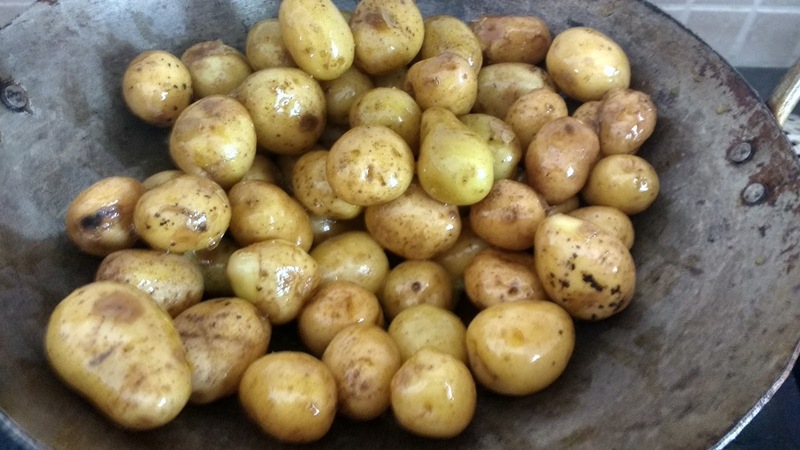 We generally peel and wash the large potatoes before actually making any dish out of them. However, this same method with these baby potatoes will take your entire day as well as consume all your patience as they are really small in size and large in number. So what we actually do before we proceed with cooking these baby potatoes is we wash them thoroughly and let them stand in water for 15-20 minutes, then drain away all the water and spread these on a kitchen towel. 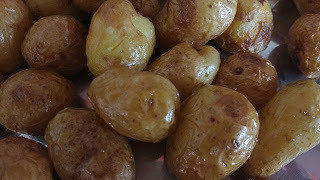 Rub them so that loose skin from the potatoes comes off. Wash the potatoes and rub on a coarse cloth or a kitchen towel to scrub off the loose skin over potatoes. Heat oil in a wok. 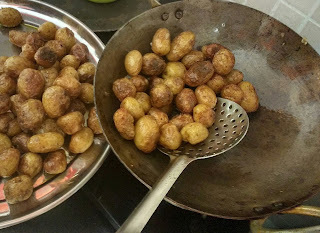 Add potatoes and shallow fry for a few minutes on high flame. As the potato skin starts getting dark in colour, slow down the flame and let the potatoes fry. Once the potatoes become brownish in colour, test some of them by pricking with a toothpick whether they are cooked till the centre. Take out all the potatoes (if done) in a plate now. Remove the excess oil from the wok. Leave only 1 tsp oil in it. Add ginger paste, cumin seeds, coriander powder, chilli powder and fried potatoes. Mix well. After 2-3 minutes, add dry mango powder, chaat masala, roasted cumin powder and salt. Mix well and switch off the flame.